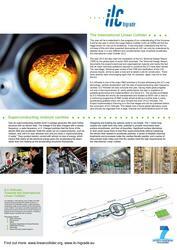 Standort: 1.2: ILC Poster . The year 2012 will mark the completion of the ILC Technical Design Report (TDR) by the global team of some 2000 scientists. The Technical Design Report, documents the project’s technical and organisational maturity and marks the fact that all major technical questions required to construct the ILC have been solved. The next stage, following peer review of the TDR and clarification of the LHCphysics results, will be to seek a host and to select a site for construction. There have recently been encouraging signs that, for example, Japan may bid to host the ILC. 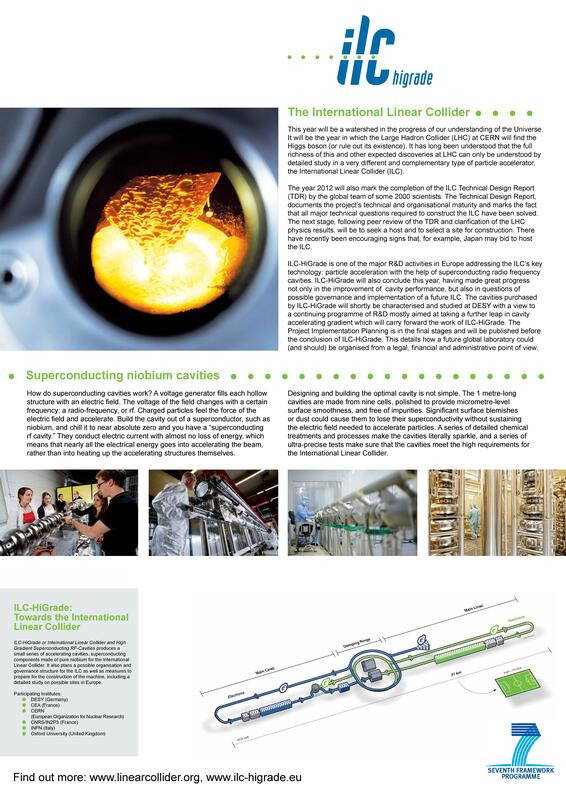 ILC-HiGrade is one of the major R&D activities in Europe addressing the ILC’s key technology: particle acceleration with the help of superconducting radio frequency cavities. ILC-HiGrade will also conclude this year, having made great progress not only in the improvement of cavity performance, but also in questions of possible governance and implementation of a future ILC. The cavities purchased by ILC-HiGrade will shortly be characterised and studied at DESY with a view to a continuing programme of R&D mostly aimed at taking a further leap in cavity accelerating gradient which will carry forward the work of ILC-HiGrade. The Project Implementation Planning is in the final stages and will be published before the conclusion of ILC-HiGrade. This details how a future global laboratory could (and should) be organised from a legal, financial and administrative point of view.